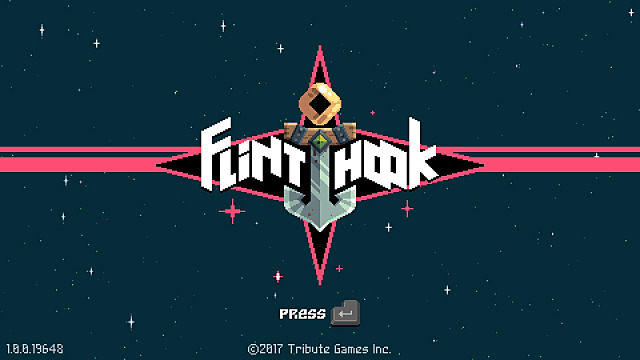 Flinthook is a 2D platforming based rogue-lite game that has been brought to us by the team over at Tribute Games, who are also responsible for games such as Wizorb and Mercenary Kings. 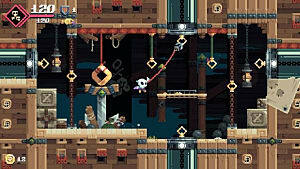 It's a game that's managed to catch some attention at several gaming conventions and trade shows in the last year or so, with it's appealing art-style and inviting premise of travelling around primarily via grappling hook. It's now finally here for all of us to enjoy. Let's take a quick look at the Quickhook (I had to). 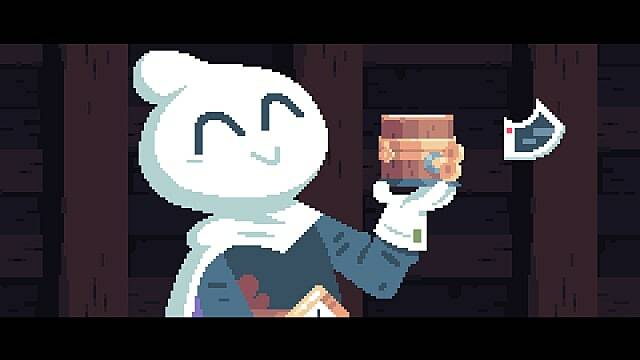 The thing that Flinthook quite possibly does better than anything else, and does so right off the bat, is give the player a wide range of useful and entertaining central mechanics to play around with, and then set them free to learn and explore by themselves. 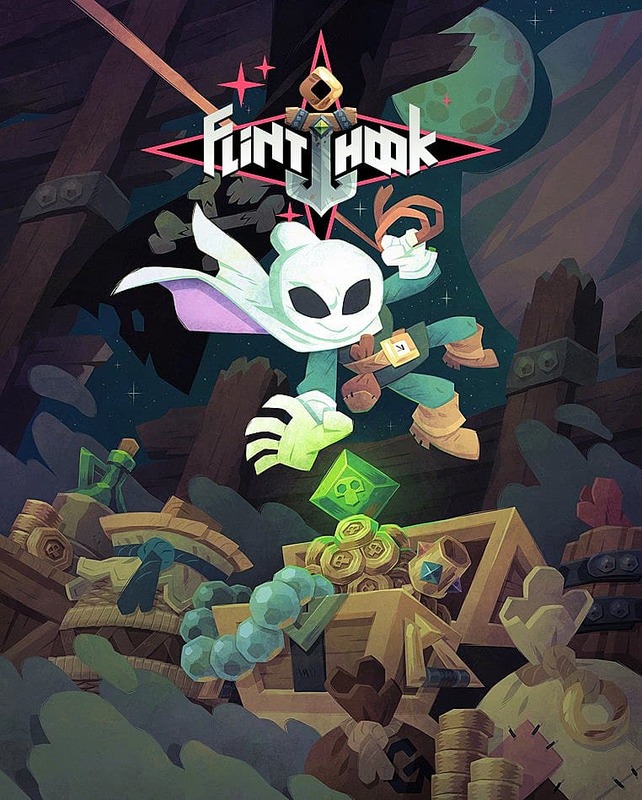 Within the first five minutes of gameplay Flinthook introduces the ability to shoot in any direction, use your grappling hook in any direction to swing off hoops, briefly slow down time, use sub-weapons, and jump off walls with minimal text or hand-holding. Everything else is either gleaned through player experience or explained very clearly within the first hour or so of gameplay. This swath of abilities presented to the player gives them almost complete control over any situation they may encounter. This leaves the difficulty down to the player's own skill, as well as how they choose to play the game, rather than to chance due to shaky game design or feeling under-equipped. This is also where Flinthook's more unique features start to shine. 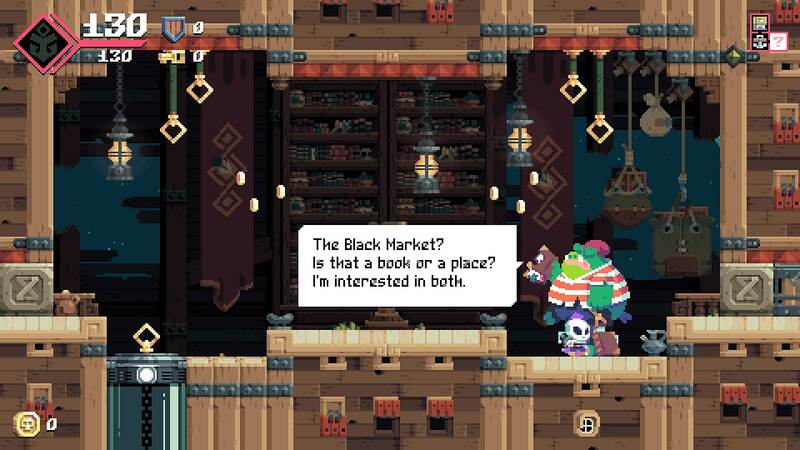 Flinthook allows the player to customize and pick the way in which they progress, how their character handles, and how their character grows. 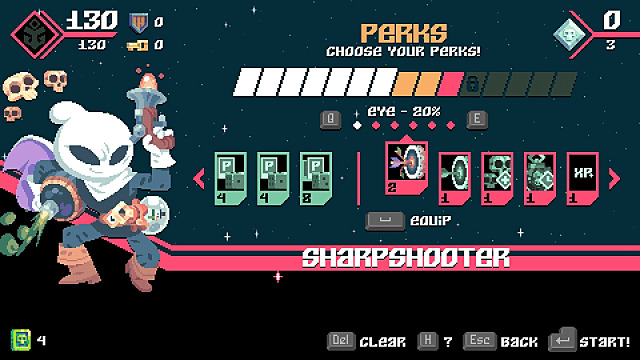 In between new runs of raiding pirate ships, the player can select a set number of perks that modify the way that Captain Flinthook plays, ranging from extra health to all kinds of upgrades and modifications for your pistol and so on. Selecting perks for Captain Flinthook before the start of a new run. 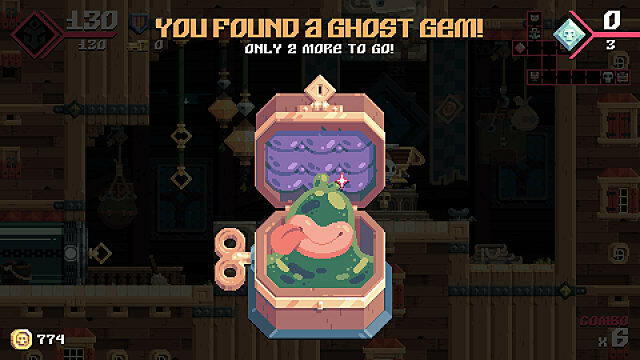 Completing a run of raiding pirate ships in Flinthook will reward you with special green coins that can only be spent at the Black Market in between runs to buy character upgrades. Unlike the perks you buy on a ship that are lost upon death, which are the main use for all of the gold found on these ships, all of the upgrades purchased in the Black Market are permanent additions to the Captain. The items for sale range from permanent health extensions, to experience boosters, to unlocking the harder versions of basic bounties. They are all useful in some way, and should keep the player busy unlocking them, as they gradually become much more expensive. Black Margot and Trevoy Ploom, the duo of deals at the Black Market. You will need every upgrade that you can in Flinthook, because even though it is a very accessible game that is easy to pick up, it is still challenging from the start and it only gets harder. The game is always fair with it's challenges, thankfully, but you may still find yourself doing at least three or four half-hour runs to attempt to take down a boss. Thankfully, the occasionally trying difficulty is forgiven thanks to the core gameplay. 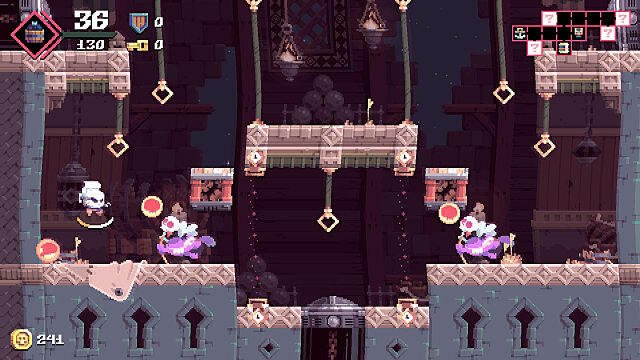 All of your abilities are useful in both platforming as well as combat, and the two intersect very often, keeping the skirmishes that you have with enemies constantly fresh, as you have to take into account the enemies placement and abilities, as well as where they spawn in each unique room. Every combat scenario and platforming/hook shooting challenge that the game throws at you will need to vary up your previous strategy somewhat. While the game never radically deviates from its established formula, keeping consistent with the constant shooting, shopping, and strategic platforming, these slight changes between each scenario keep the experience from getting stale too quickly. Using bullet time to dodge flaming skull projectiles at close range. In fact, the abilities that you begin the game with, in particular the Quickhook, allow for the game to have a masterfully quick sense of pace. Loading times are lightening fast, travelling between screens takes maybe a second, and you can backtrack over a dozen rooms in a little over a minute thanks to the wonderful flowing freedom provided by your movement abilities. 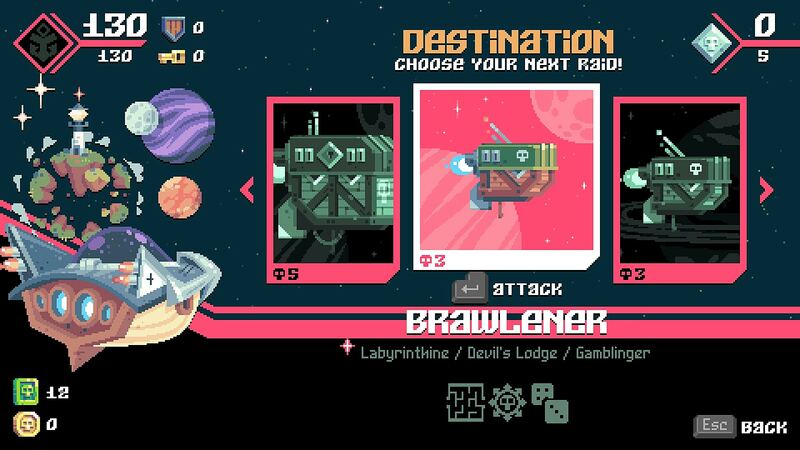 On top of that, you also have the option to pick between several different ships to raid when picking the next one in a run, and they all have symbols with small descriptors at the bottom of the screen briefing the player on what to expect inside them, as well as skull-based rating of how dangerous a particular ship is. While there isn't always a big difference between the ships, and on the off occasion you may run into one or two duplicates of each other, the typically allows for further choice in the way that the player proceeds with varying the gameplay, challenging themselves, and even prioritizing certain routes for perks, items or collectibles (such as relics and lore pages). Another thing that greatly alleviates some of the frustration of typical roguelikes is Flinthook's lack of perma-death. If you die in the middle of a run, you are made to start over again from the beginning, but you gain experience and retain most of the treasure that you've discovered on the way whether you win or lose. 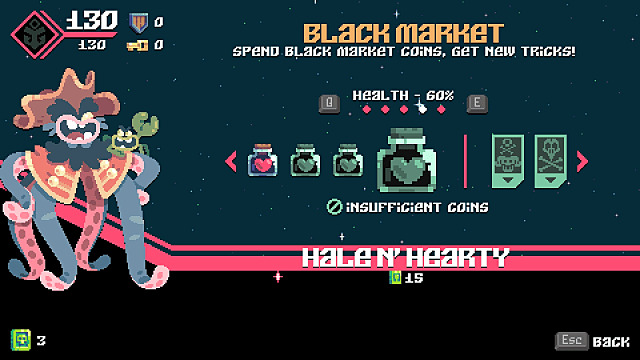 You are rewarded more for winning and completing a run, but by being less punishing through death by allowing the player to keep their earned rewards, each death becomes a learning experience rather than a slap on the wrist, which keeps the game flowing. Flinthook has absolutely lovely pixelated graphics. The cartoony art-style is consistently expressive and appealing, with dozens of tiny individual animations often going on at the same time on one screen, giving the world a very lively feeling. The game also runs very well even on lower-end PC's, and only takes about 5 minutes at most to install, which is a nice bonus. This is backed up further by impressively detailed character sprites and a wonderful color palette with character designs that take full advantage of both the space and pirate themes. Captain Flinthook in particular is noteworthy for being a very likable and emotionally expressive protagonist despite having no dialogue or discernible identity. Captain Flinthook, the little space pirate that could. Slimey, your trusty goo compass. Librarious, the bibliovoric librarian of in-game lore. The soundtrack is also a quite the earworm. Every track is energetic or pleasant to listen to, and even with the recurring situations and replaying of levels leading to the frequent repetition of nearly every track, their quality prevents them from becoming tedious. For those of you interested in the soundtrack, it is available for purchase on bandcamp. Flinthook is a fast, fun, charming and just overall polished experience that is difficult to fault. It isn't perfect, but does what it sets out to do so well that it hardly matters. The story could have been more involving than it was, although it's attempt at building a world is worth noting, and the gameplay can get slightly repetitive over time, but none of that distracts from what is a very solid game with an extremely satisfying central mechanic. It's a game that's very easy to pick up, fun to play, and puts you in that mindset of "just one more run before I go to bed", that'll keep you up into the early hours of the morning blasting baddies and grabbing goodies. Tribute Games has delivered an excellently paced, charming, and wonderfully fun rogue-lite game accessible to nearly everyone.